Learn to Play Drum - Do YOU Wanna Play in This Band? Opportunity to learn to play drum. Search for more Calgary music and education. Ever wanted to learn to play drum in a musical group? This may very well be your chance. Play steel drums or percussion in a well established band. In the steel drum music band, known as the Calysto Steelband, you will have fun learning to play drum as all instruction will be provided. The band has six main sections. 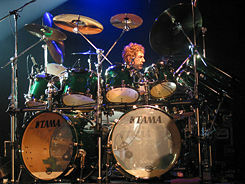 Single tenor steel drums (that play the melody), double-tenor (melody also), double-second (that play the back-rhythm), triple cello (that fill out the sound), quad- and six-bass steelpans and finally drums & percussion, the "engine room" so to speak. Why learn to play drum with Calysto Steelband? It's free to join and what we really need is a commitment to this act, including the ability to attend regular Calgary jams, practices and performances (gigs) in and around the city map (and elsewhere, including Barbados at certain times in the past) and some of the attributes outlined below. Come see one of our performances (such as our annual street performance at the Calgary Marathon every May) to get a glimpse of the fun. We are always looking for lead players for the single tenors who have considerable music education and can sight-read well. Although I have been studying "The Complete Idiot's Guide to Playing Drums", playing in a band such as this is suited to an individual with varied and extensive experience and loves people. At other times, though, the band has been known to recruit enthusiastic individuals without much experience, but have a secret passion to learn to play drum. A great opportunity for music education. Contact Barry Lough of the Calysto Steelband Non-Profit Society at (403) 547-7557 to see about attending Monday a night practices on a consistent basis and performing regularly. Guarantee: Many challenges and good times to be had. Some international travel possibly. We even record and release CD's on occasion. A new social group and a chance to learn steel drums. 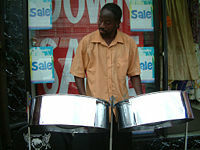 Read some of the history of steel drums in this article. Go back from Learn to Play Drum to the Steel Drum Pans webpage or visit the Calgary City Maps homepage.